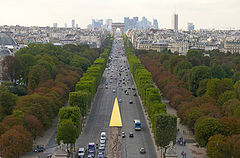 Champs-Élysées (फ़्रांसीसी pronunciation: [ʃɑ̃zeliˈze] ( सुनें)) is a prestigious avenue in Paris, France. USD1.5 million per 92.9 m². ↑ Elaine Sciolino, "Megastores March Up Avenue, and Paris Takes to Barricades", New York Times, 21 जनवरी 2007.